NIGHT OF THE LIVING DEAD Joins Criterion Collection in February! Great news, zombie fans, the Criterion Collection have decided to honour the late George Romero by adding his seminal classic, Night of the Living Dead, to their roster this February. Romero's first film famously ended up in the public domain which has resulted in numerous unofficial releases and even a colorized version from Legend Films. But this new 4K release will no doubt become the one to have. 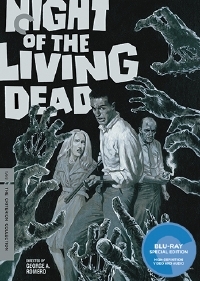 Shot outside Pittsburgh on a shoestring budget by a band of filmmakers determined to make their mark, Night of the Living Dead, directed by horror master George A. Romero, is one of the great stories of independent cinema: a midnight hit turned box-office smash that became one of the most influential films of all time. - New 4K digital restoration, supervised by director George A. Romero, co-screenwriter John A. Russo, sound engineer Gary R. Streiner, and producer Russell W. Streiner. Night of Anubis, a never-before-presented work-print edit of the film. - Two audio commentaries from 1994, featuring Romero, Russo, producer Karl Hardman, actor Judith O’Dea, and more. - New program featuring filmmakers Frank Darabont, Guillermo del Toro, and Robert Rodriguez. - Never-before-seen 16 mm dailies reel. - New piece featuring Russo about the commercial and industrial-film production company where key Night of the Living Dead. - Archival interviews with Romero and actors Duane Jones and Judith Ridley. New interviews with Gary R. Streiner and Russel W. Streiner. - Trailer, radio spots, and TV spots More! PLUS: An essay by critic Stuart Klawans.